Free Gamer - Open Source Games: Tiny game: Stop the Zombies! 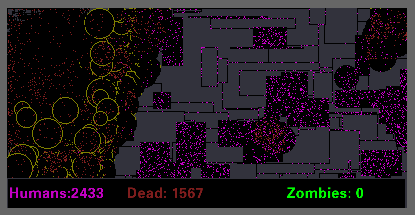 I discovered a tiny and minimal Java/Processing game through future superstar game designer William: Stop the Zombies! Launch nuke circles. Save human pixels. Kill zombie pixels. Or just kill everything. The code is under a "Do whatever you want with it" license as far as I'm concerned, as it says in the code, it was based on someone else's code already. It should be noted that that code will no longer compile due to changes in the Processing environment over the years.